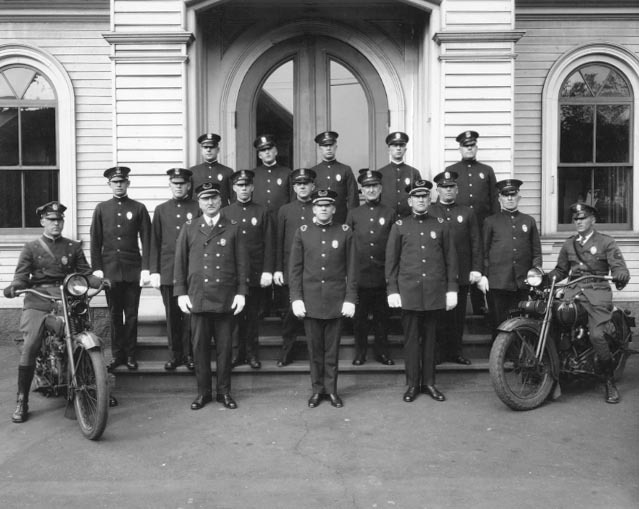 Portrait of the Swampscott Police Department, with two members on motorcycles, in front of Town Hall in 1926. The Chief of Police was fired and the department reorganized in 1925 as a result of the "Rum Running Scandal." --from Swampscott, Massachusetts : celebrating 150 years, 1852-2002, Swampscott Historical Commission, 2002. “Swampscott Police Department, 1926,” Swampscott Public Library, Swampscott, Mass., accessed April 25, 2019, https://digitalheritage.noblenet.org/swampscott/items/show/162.